Important notice: Mother's milk is the best nourishment for your baby. Therefore, WHO and Holle recommend exclusive breastfeeding for the first six months and then continued breastfeeding together with a suitable and balanced supplement according to your baby's age. Consult a healthcare specialist (pediatrician, mother's advice, midwife) if your child needs a food supplement or if you no longer want to breastfeed. 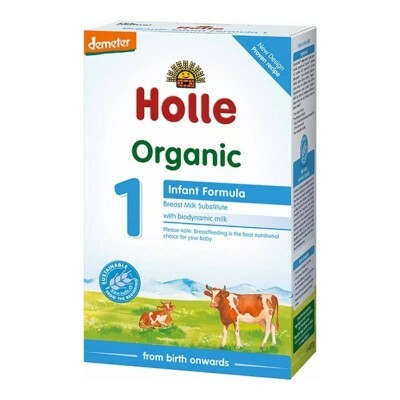 Holle Organic Infant Formula 1 is made from 99% organically grown ingredients. The milk used in the Holle formula comes from cows raised on biodynamic (Demeter) farms in caring and appropriate environments. All of the farms supplying Holle strictly adhere to EU organic regulations and, moreover, to the stringent international Demeter regulations. Grazing the cows on lush biodynamic fields and pastures is the reason for the quality of the milk used in the Holle formulas. Demeter farmers avoid the painful dehorning of cows. Holle baby milk formulas are also CO2 neutral. Suitable for baby from birth. Skimmed milk** (Germany), whey powder* (partly demineralized), vegetable oils* (palm oil*, rapeseed oil*, sunflower oil*), maltodextrin*, skimmed milk powder**, calcium carbonate, potassium chloride, sodium chloride, vitamin C, vitamin E, ferrous lactate, zinc sulphate, niacin, calcium-D-pantothenate, copper sulphate, vitamin A, vitamin B1, vitamin B6, manganese sulphate, potassium iodate, folic acid, vitamin K, sodium selenate, vitamin D.